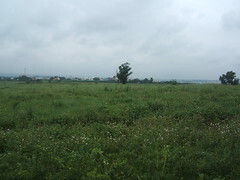 The official announcement was made yesterday that the phase-one Environmental Impact Assessment (EIA) for Taiwan’s Central Science Park development on Ci-sing Farm, Houli, which was approved by the Environmental Protection Administration (EPA) in 2006 under circumstances which caused outrage among EIA Review Committee members, has been cancelled by the Administrative Court. 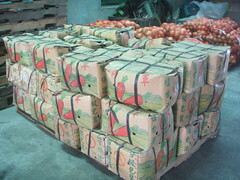 This is the result of a lawsuit brought by six farmers from in and around Houli Township, Taichung County, who are represented by a group of lawyers including Lawyer Lin San-Chia and Lawyer of Record Chen Bo-jhou of Wild at Heart Legal Defense Association. 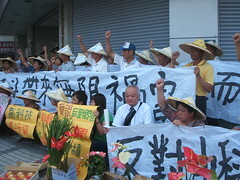 The complainants had accused the EPA of violating the EIA Act in the method by which it had approved the development of an LCD and semi-conductor factory on Ci-sing Farm, Houli at the Plenary on 30 June 2006, saying that the project should have been subject to a phase-two EIA, a further assessment required of projects deemed likely to have a significant impact on the environment. In addition, it was claimed that there had been twenty violations in the Environmental Impact Statement for the project, including insubstantial or false assessments of impacts on irrigation water supply and levels of heavy metal contamination, and a failure to consider human health and pollution of groundwater and crops. On the day of the Plenary a majority vote (10:8) approved the project – but several of the voters were government officials who had not participated in previous review meetings for the project. At the time, commissioners claimed that pressure had been exerted on the EPA and the commissioners by the Executive Yuan to push the project successfully through the EIA process, despite great concern amongst local residents and commissioners over the impacts of pollution and what they believed to be insufficient impact mitigation measures proposed by the developer, AU Optronics (友達光電). One major concern was that the effluent treatment plans proposed by AU Optronics meant that high-tech waste water, which would flow through agricultural land and into Dachia River and Daan River, would not meet agricultural standards for pollutant concentrations. In addition to arguing that commissioners had been told to vote before fully understanding the details of the case, the prosecutors also stated that voting had taken place before it had been established whether or not the project would have significant environmental impacts, a crucial step in determining the result of an EIA review. Houli, Daan and Dachia Rivers, and Indo-Pacific Humpback Dolphin Distribution. 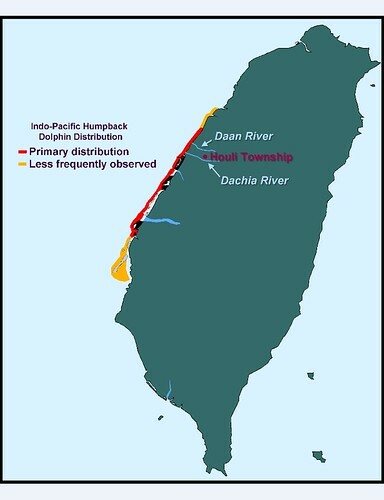 Besides being a success for farmers in and downstream of Houli, today’s announcement is also good news for Taiwan’s Indo-Pacific humpback dolphins, whose habitat includes the estuaries of Dachia River and Daan River. According to the conclusion of the Second International Workshop on Conservation and Research Needs of the Eastern Taiwan Strait Population of Indo-Pacific Humpback Dolphins, held in Chuanghua City in September 2007, two of the five main threats to this small population of dolphins are pollution and reduction of freshwater flow into their habitat. However, the prosecuting side warned that this does not yet mean that construction must cease, as it is expected that the EPA will appeal the decision. Whether or not the plug is pulled on the project will depend on the result of that appeal in Taipei High Administrative Court. The full transcript of the decision will not be available until next week.